The patented mini-channel, with contour, provides an even saturation of the paddles surface while preventing pooling and vertical flow at the edge. This reduces streaks associated with traditional flat surface paddles. 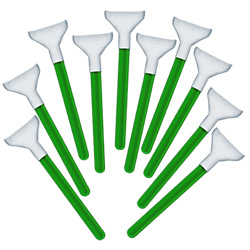 The mini-channels also provide the extra reservoir to absorb the excessive liquid and prolonging the moisture life of the swab during the cleaning process.In stock! Order now!